Skeleton keys have long been used as protective amulets and charms,due to being made of iron, through out many cultures and folk practices. They are also symbolic of opening doors-to occult knowledge, practices, unlocking mysteries, and removing blockages to your goals in life. Keys are also sacred to many deities and saints such as Eleggua, Papa Legba, Saint Peter, Hecate, Janus, etc. 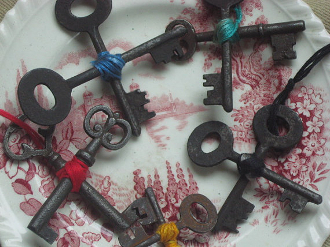 These skeleton keys are from the early 1900's and are a bit rusty and oily due to age, use and storage. Please use the drop down menu to make your choice; color shades may vary from photograph. Keys average from 1.5 to 3 inches.